News and information about SuSE. 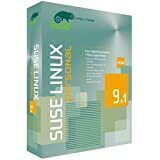 SuSE Linux is a Linux distribution from Germany that was originally a German translation of Slackware Linux. Today, although still developed in Germany, it is one of the leading Linux distributions, and since 2004, has been owned by Novell.